Shane Dawson has been around basically ever since YouTube was still something more of a dirty secret you didn't tell people about because it was considered weird to post videos online. Today, things have changed. Dawson is someone basically anyone who is interested, or obsessed, with YouTube knows of at least. Not everyone watches him, but you certainly hear the name. He's known for his self deprecating stories and jokes, for playing stereotypical characters in the most offensive way possible, and for loving food. I can definitely relate with the latter. When going into this book, I expected it to be more or less the same thing as Binge by Tyler Oakley, meaning, Shane Dawson telling stories about his life recounting it from childhood up until now. To my surprise, that wasn't quite what I got. I Hate Myselfie does contain stories from his life, but they are not ordered chronologically but rather 'random' stories ranging from raw to funny or just very, very emotional and honest, like the story about his grandmother, from different moments in his life. Being more of a casual viewer of Dawson, I don't know if any of these stories are ones his followers have heard in one way or another already, but to me all of them were new and offered me an insight into Dawson's life, a glimpse behind the curtain of the person that is Shane Dawson. Reading about his struggles, addictions, how weird it was for him to see people recognize him in real life, or deal with strange dreams was very interesting, and just showed, once more, that even popular YouTubers are just humans at the end of the day. Since I've listened to the audiobook, instead of reading the book myself, I got to enjoy the extra personal layer brought to me by the fact that the audiobook is narrated by Dawson himself. He created funny voices for some of the people in the story and the way he read out all the stories made it feel almost like he was right there next to me just telling me them casually, like a friend would do. I really appreciated that, this friendly tone with which the book is narrated. It doesn't read, or listen, like a stiff memoir but rather like a conversation, though it is quite one-sided. Sure, Dawson might not be the master of writing, the most professional at it knowing all the rules or using the most poetic and flowery language, but that didn't take away from the content at all. It was still fun, and surprisingly addicting. While listening to this audiobook, which is over four hours long, I've found myself laugh out loud numerous times, but also cringing in second hand embarrassment, but I enjoyed it from beginning to end. It was a fun, light book, a good way to ease yourself back into reading if you're experiencing a reading slump like me. All in all, I Hate My Selfie is an interesting collection of stories taken out of Shane Dawson's life, which might be exaggerated for comedic value or not, showing you a look behind the curtain, or outside of the cameras view. This might certainly not be for everyone, especially young readers due to strong language or offensive jokes I doubt parents of 12 year olds might appreciate, but if you like Dawson (and are not easily offended), or just want to read something entertaining and light, this might be something for you. 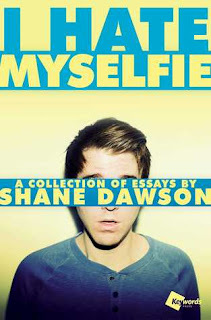 I give I Hate My Selfie: A Collection of Essays by Shane Dawson 5 out of 5 stars.